Amazon Announces New 2018 Edition - Echo Dot, Echo Plus & Echo Sub in India. When it comes to competing in the Smart Home Speakers race with Google, Apple and Samsung, Amazon has instead stayed ahead of the curve due to the vast ecosystem of the skill-sets present on AWS store. Another strong point that remains in Amazon's repertoire is that they were the first to bring such a concept and suddenly with the boom of IOT, the idea of having a smart speaker in the house has taken off. Extending their portfolio today, Amazon introduced new Echo Dot and Echo Plus. Echo Sub was also introduced in the Echo Family, letting users add a sub-woofer to the compatible Echo devices. The new Echo Dot gets a wholly refreshed look, it looks a bit bulkier and if you could relate it seems much more like Homepod's Design due to the new Fabricated look and appeal. This new design brings the only biggest concern with the Echo Dot, which is the enhanced powerful sound support. While as always there's a 3.5mm audio jack present in the back so that the user has the novelty to add it to his home theatre or any music system supported. Besides you can also connect it to the Bluetooth supported audio devices. It's available in following colours - Charcoal, Heather Gray and Sandstone variants. It can perform all the functions any Echo Device can perform(including setting up alarms, playing music, set timers, alarms and controlling your smart home devices etc. ); however, you might get the Audio Heavy performance as expected from its superior siblings. 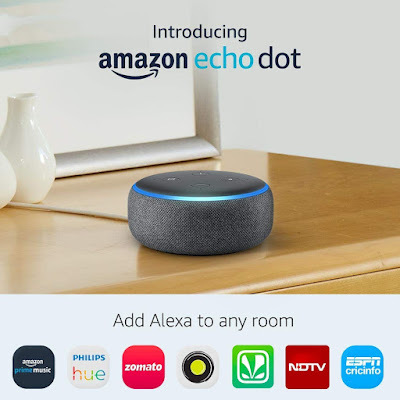 Despite this fact, the new Echo Dot gets priced at Rs.4,499 which is the same price the earlier generation Echo Dot received. The Echo plus is an upgrade to the existing Echo Plus, however in a much more bloated version, it seems as if the old version was cramped and squeezed to fit the new design. The new variant even comes with a built-in Zigbee smart hub just like the last generation Echo Plus. With the simple command, "Alexa, discover my devices,” you can connect the supported Zigbee router and end node devices without the need of any proprietary app. Still the integrated Smart Hub lacks the support for Z-Wave devices, as usual; however, it includes an integrated temperature sensor which will determine the temperature, but cannot control it stand alone. Though with the help of Alexa, you can create smart routines upon which if the temperature exceeds a certain threshold, your AC could turn on provided it's connected to a smart plug. Speaking about the aesthetics, the new Echo Plus features a large 3" Neodymium woofer which helps in increased volume, resulting in better bass output. It's available in Charcoal, Heather Gray and Sandstone variants. The all new Echo Plus still retains the same price tag, which is it gets priced at Rs.14,999. The New Echo Sub: First Wireless SubWoofer. The Echo Sub is the newest addition to the Echo family. 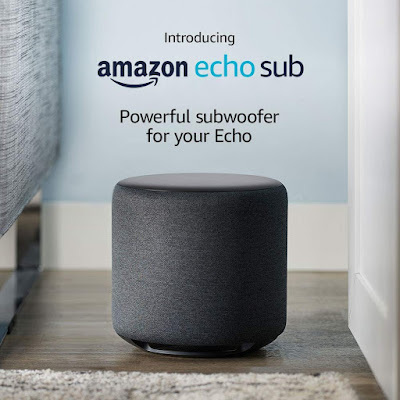 The Echo Sub is a wireless SubWoofer which connects to your existing Echo devices, with this one can create a 1.1 or 2.1 stereo surround sound setup with compatible devices. Besides, the user gets to adjust the Bass, Mid-Range and Treble with the equaliser feature via the command, "Alexa, turn up the Bass/Treble." 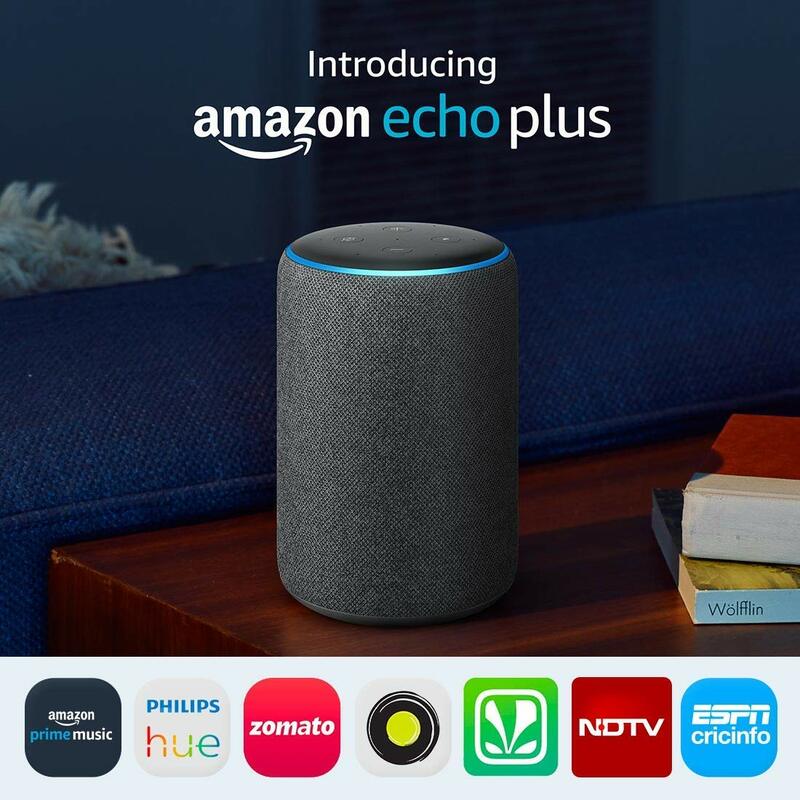 All the newly launched Echo devices are available to buy on Amazon India right at this moment, click here to visit. However the new Echo Dot and Echo Plus will start shipping next month, whereas the Echo Sub will be available later in the year. Also Read: Fossil launches their 4th Gen Smartwatches dubbed under Fossil Q lineup.